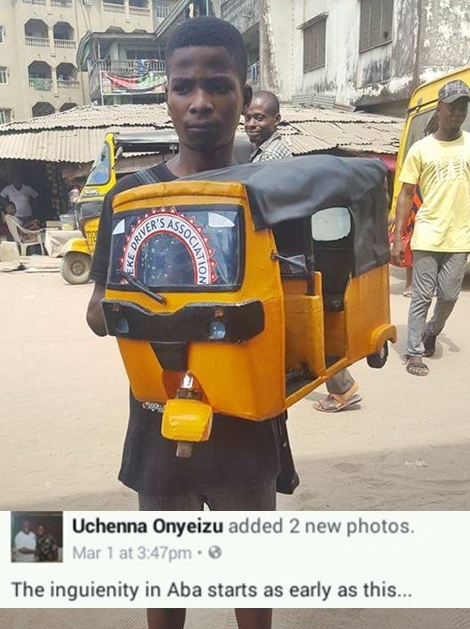 A Facebook user, Uchenna Onyeizu, has taken to the social media platform and shared the photos of a very young boy in the commercial city of Aba, Abia state, who successfully produced a proto-type of a tricycle popularly known as Keke Napep. Uchenna, who posted the photos online, wrote; ‘The ingenuity in Aba starts as early as this’. Whether it is a ‘toy’ Keke or not, the young boy deserves a pat on the back and if possible sponsored for development because there’s obviously a genius in him. 0 Response to "Young Genius! See the Keke NAPEP Manufactured by a Boy in Aba"